If you would like to buy a sunbed for your own personal use rather than hiring then we offer a range of new and ex-hire sunbeds for sale. The price is dependent upon the number of hours that the sunbed has been used for, all our hire sunbeds have an hour counter on so we can see exactly how many hours they have been used for. An ex-hire unit will be fully working and achieve the same results as a newer sunbed, however it will usually have some minor scratches. In all cases we offer a 28 day hire / trial of the unit so that in the event that you are not completely satisfied with the sunbed after 28 days we will collect it and refund your money, less the hire fee for the 4 weeks. We can also sell brand new canopy or top and bottom sunbeds, ring for details. The sunbed tubes last around 600 – 800 hours before they need replacing. 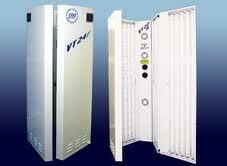 The whole sunbed can be then re-tubed for £250 – £400 depending upon the brand of tube bought. Assuming the sunbed was used for approximately 1 hour a week (quite high usage) then a sunbed that has done 300 hours would have around 6 years use before the tubes should need replacing.